Having achieved some excellent recycling rates and found some additional solutions Buzzacott were looking to move to the next level of the waste hierarchy and identify further improvements in their recycling and waste processes and protocols in their office facility in London's square mile. Given the restrictions and issues caused by a lack of space and retaining control of costs the organisation was looking for innovation and advice around the existing recycling and waste service. Buzzacott engaged i-Clean Systems to undertake a recycling and waste benchmarking review that would report on all aspects of recycling and activity across the facility. This included a review of the current service provision, processes and console configurations within the building. Through a benchmarking review which examined every aspect of the recycling and waste processes and protocols across the Wood Street building, including all costs, waste streams and end of life solutions, Buzzacott were able to consolidate on their historical success. As part of their report i-Clean Systems were able to produce a list of 15 innovative next step strategies and solutions that will help the organisation move up the waste hierarchy. 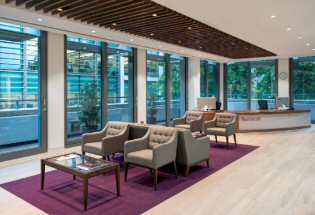 These strategies were bespoke to the building and the people working or visiting the environment; they took account of the space issues that many central London companies face and ranged from quick win solutions to others that need a more long-term approach. They were designed to: increase recycling; drive costs down where appropriate; help the organisation embrace the circular economy and reduce the carbon footprint of the building. "Working with the recycling and waste division of i-Clean Systems ensured that our recycling and waste activity and data was reviewed by an external and independent advisor. The benchmarking review strengthened our confidence in our own statistical information and confirmed that we have been adopting appropriate solutions. The process also opened our minds to additional, relatively easy to implement solutions whilst further embedding recycling in our office culture. A 100% recycling process is now an achievable vision for our organisation"
Buzzacott provide specialist accountancy and business services to a wide range of clients from their office in Wood Street in the Heart of London's financial district. The firm's 33 partners and more than 330 team members provide expertise in numerous sectors and have been doing so for nearly 100 years.